Welcome to Percussion at UA! Our comprehensive approach trains students in the full range of percussion instruments, preparing them for successful careers as teachers, performers, composers, and more. 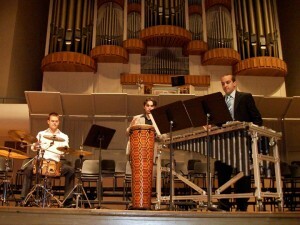 Our percussion studio offers a broad range of opportunities, including the University of Alabama Percussion Ensemble (shown here) and more than a dozen others. Find more information on our percussion studio page.